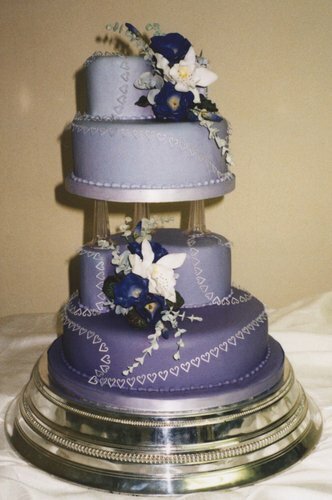 An distinctive 4 tiered wedding cake inspired by the Millennium in shades of purple and silver. The top two tiers float on crystal pillars above the lower tiers in graduated shades of purple. The cakes are decorated with beautiful purple sugar Lisianthus, Orchids and silvery Eucalyptus. Delicate silver lacework flows round the cakes linking the design together.